Literary works can be categorized in different genres. These comprise of prose, poetry as well as drama. All of which have defining characteristics which differentiate one from the other. However, within these different genres, are a different subset of genres as well. For the purpose of this intertextual analysis focus will be shone on two pieces of one such subset: dystopian stories. The stories to be observed are: “There Will Come Soft Rains” by Ray Bradbury as well as “The Star” by Esther Claes. In “There Will Come Soft Rains” by Bradbury, a futuristic scene is cast as the setting depicts an assumed situation in August 2026. The story follows the sequence of events at different times throughout the day of what the author envisions a house to be at this time (2026). Written in the third person point of view, the house is the main character with minor supporting roles appearing throughout the piece (cleaning mice, the dog). It cooks breakfast, cleans itself, knows the date and time of day, has built-in security and is equipped to even speak to its owners. The house is the lone survivor of what happens to be a nuclear explosion and still carries on with its regular routine. “The Star”, written by Esther Claes, tells of a celebrity who witnesses/ is amidst a world which is coming to an end but who refuses to acknowledge the situation and is deeply rooted in denial. Written in the second person point of view, this story proves effective in that it throws the reader into the situation by its use of the direct approach (“…you were ashamed of yourself for weeping…”). These two stories were very effective in their own rights but many striking similarities can be seen between the two. One such similarity and perhaps the most obvious would be the dystopian element of both. Set in futuristic settings, this literary style mostly depicts an end of the world sequence of events and these stories were no exceptions. Bradbury’s “There Will Come Soft Rains” is set in 2026 and shows the decimation of a population by what is implied to be a nuclear explosion (remnants of shadows of a family outside on a wall of the house proves this) and “The Star” explicitly states that there was a war and it was the end of the world. Both stories also take place within a day. Evidence of this is shown in “There Will Come Soft Rains” where the hours are stated “tick tock, seven o’ clock….. eight-one… nine-fifteen…” and as such the reader is able to follow sequentially and pinpoint the time frame of events. It was also shown in “The Star” where although there were flashbacks and events leading to the day shown, there is a definite story break where the main course of the story continues. Both main characters, through all the disparity, remain in denial and chose to either ignore or were oblivious to their surroundings. This was shown with the house in the sense that in spite of the event of the nuclear explosion, it carried on the usual routine of the household (making breakfast, cleaning, pulling out bridge tables etc.) and “the star” was fussing about business ventures and appearances that were scheduled. Another similarity was the setting of both stories. Events were seen within the scope of houses. In “There Will Come Soft Rains” the main character was a house whereas in “The Star” the protagonist was barricaded in her house. Though obvious similarities were shown, differences were just as evident. These differences lie in protagonists, literary devices employed and points of view both were written in. As previously stated, “The Star” was written in second person point of view and was effective in that with direct address, readers could get a glimpse of what such a reality could be like, as reference is made to “you”. However, in “There Will Come Soft Rains”, the third person is used and also proved effective as a wider appreciation of the situation could be elicited as an omniscient feel is given. Another difference is with the protagonist of both stories. “The Star” employed people, whereas Bradbury’s story’s protagonist was a house and the story was void of any living organism (spare the dog). Literary elements were also different in their usage by nature of the difference of the stories. In “There Will Come Soft Rains” Bradbury laces the piece with heavy personification as the protagonist is inanimate (a house). Human characteristics are given to the house, the cleaning mice, as well as the fire which in the end devours the house. The house is shown as speaking, cleaning and singing. Another striking use of literary devices in this piece was “The house was an altar with ten thousand attendants…” a metaphor emphasizing the loneliness and reality of the house and its importance and the role it had played to its “gods” as they were referred to in the same extended metaphor. Irony was also seen in Bradbury’s work where the house recites a poem from Sara Teasdale about birds and spring being unaware of a war and perishing of mankind while the house itself could be likened unto these birds. In “The Star” the main literary device used was hyperbole (which was applied to the situation and the dystopian theme as a whole-where present day readers see this occurrence as unrealistic and even extreme). Submitted for ENG 102 Literature and Composition, Fall 2014. Assignment: final exam. Instructor comment: This essay was composed in a two-hour final exam period, yet represents so much of the kind of critical thinking and connecting of texts we hope for in literature classes. Despite the time constraints, I was impressed with the interesting parallels and contrasts Patti makes and the specific evidence from the texts. 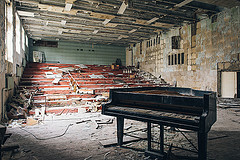 Photo Credit: “Pripyat – Music School” by Michael Kotter. Licensed through Creative Commons.